Fantastic Mr. Fox is probably the ultimate Wes Anderson (Rushmore, The Royal Tenenbaums) film in many ways. The application of Anderson's trademark quirk and style to the stop-motion animated film based on the children's book by Roald Dahl (Charlie and the Chocolate Factory) is seamless and wildly enjoyable. Anderson has drawn criticism for a lack of development in his more recent films which failed to produce sympathetic characters and compelling humour while rehashing old themes with a lack of flair his early work had. The Oscar-nominated The Royal Tenenbaums is probably his best, most polished film but it almost borders on excess in its overwhelming style and whimsy yet carefully manages to produce interesting characters and a good story. 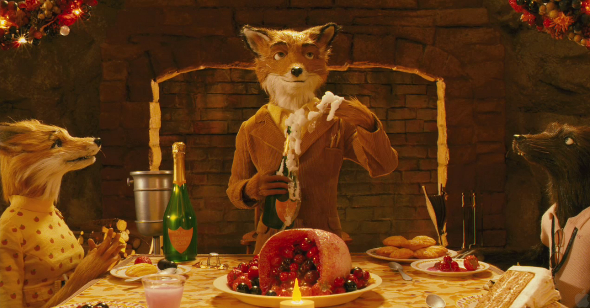 Fantastic Mr. Fox works in all its substance and overindulgence. The voice acting by the likes of George Clooney, Meryl Streep, Bill Murray, Jason Schwartzmann, Willem Dafoe, and Michael Gambon, among others is uniformly terrific. What the film captures so well is the feeling of the fantastic. The film delights in its own nuances, speed, action, and eccentricities in a fun story that captures the dark, adult tones of Roald Dahl's themes while appealing to fantastical child-like sensibilities. The pure cinematic conventions displayed on screen is nothing short of delightful. Wes Anderson, not a animator by trade, really stamps the film with his trademark style and sensibilities while sticking to what makes the art of stop-motion so visually interesting and remarkable. Fantastic Mr. Fox is just a really fun watch that really captures the essence and tone of the world of Roald Dahl.